Why Are Women Dying Younger In America? A new study has found that the life expectancy for women in the United States is on the decline. But don’t worry, this is not something that will affect ALL women in our country – just the poor women. Even more troubling, is that the study doesn’t include any statistics after 1999. What that means is, the Bush years have not been figured into these statistics. I can only imagine how the last eight years of the Bush administration have impacted the reality of these numbers. John Edwards was absolutely right when he talked about two Americas. Try to picture America on one side, and a third-world country on the other. Now picture that third-world country within the United States. Thanks to a failing economy and a serious health care crisis, that is exactly what we face today. It’s really not surprising at all. Very sad, but not surprising. Life expectancy has long been growing steadily for most Americans. But it has not for a significant minority, according to a new study, which finds a growing disparity in mortality depending on race, income and geography. 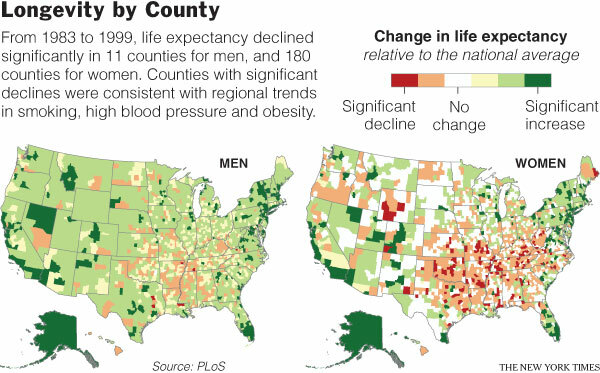 The study, published Monday in the online journal PLoS, analyzed life expectancy in all 3,141 counties in the United States from 1961 to 1999, the latest year for which complete data have been released by the National Center for Health Statistics. Although life span has generally increased since 1961, the authors reported, it began to level off or even decline in the 1980s for 4 percent of men and 19 percent of women. For the last few weeks I’ve been making an attempt at eating healthy. And usually this is where I would tell you that I’ve failed miserably. But, I’m happy to report that I have actually been doing pretty well. I think it is in part because, around the same time I decided that I couldn’t afford to gain another pound, I got an email from Elaine Magee. Funny how we get what we need, just when we need it. Anyway, Elaine is the Healthy Recipe Doctor at WebMD, and she wanted to tell me about her newest book Food Synergy. Even better, she said if I wanted a copy she would send me one. The timing couldn’t have been better. I’m not sure if it was the book or my total fear of gaining another pound, but I’ve actually lost about six pounds. It’s not that her book is a diet plan or anything…It’s really about eating healthy, and that’s what is so great about it. The book reinforced a lot of what I already knew, but also explained how different food combinations actually work to prevent disease and promote wellness. Not only is the book informative, but it is loaded with great recipes. Evidence is mounting that certain components in the food we eat and drink (minerals, vitamins and phytochemicals, fiber, smart fats, etc.) 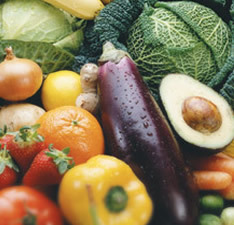 interact to provide our bodies extra disease protection and a higher level of health. This advanced nutrition science is called food synergy. Food synergy is like adding 1 plus 1 and getting 4 or 6 instead of 2; the total is greater than the sum of the individual parts (or nutrients). With each sip, you get two potent flavonoids — anthocyanin and proanthocyanidin — plus a healthy dose of catechin, which may enhance the antioxidant activity of alpha-tocopherol (a form of vitamin E). Green and black teas also contain antioxidant polyphenols, thought to block cell damage that can lead to cancer. Phytochemicals in tea have a half-life of a few hours, so have a cup now and another later to get the biggest bang for your tea bag. There are 30-plus phytochemicals in olive oil, many of which have antioxidant and anti-inflammatory action in the body, helping to promote heart health and protect against cancer. They’re also found in the olives themselves, of course.